Sensei Sandeep Desai holds a 5th Degree Black Belt in Okinawan Shorin-Ryu Karate, attained in Okinawa, Japan. He has studied Chen Style T'ai Chi under Dr. Bob Bacher at Munich, Germany. Chen is the oldest style of T'ai Chi. Trained for several years in Hatha Yoga, Sensei is perhas one of the first few practitioners to integrate these two ancient disciplines. On a more resent note, Sensei has returned from Miami in the U.S. having successfully completed an advanced course in T'ai Chi and Chi-Gung. 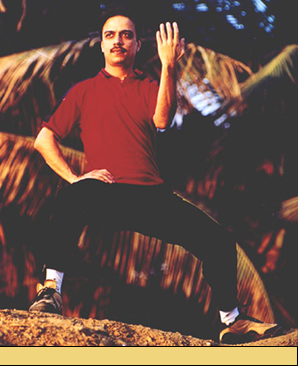 During this period he also conducted several workshops on Hatha Yoga and T'ai Chi in Miami. He has been featured on major television networks and currently writes a column in the Indian Express. Sensei conducts workshops and classes at several centres in the city and abroad.